These soft, dark chocolate thumbprint cookies are filled with homemade caramel sauce, drizzled with melted dark chocolate, and sprinkled with flaky sea salt. To tell you the truth, I wasn’t actually planning on sharing this recipe on the blog. Sometimes I bake things just for the fun of it, you know? But after posting a photo of my late-night cookie baking adventures, several people asked for all the deets on these salted caramel and dark chocolate thumbprint cookies. And I couldn’t just leave you all hanging! This recipe is adapted from A Latte Food’s chocolate caramel thumbprint cookies. I wanted to make a few adjustments to the recipe, including using all dark chocolate and making a homemade caramel sauce because I’m a chronic overachiever. 😉 But trust me, it’s worth it. 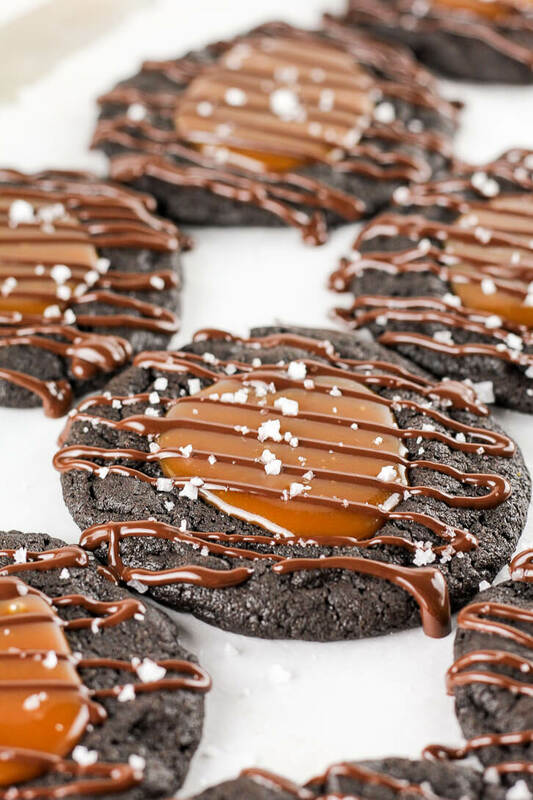 In fact, in the words of my taste testers, these salted caramel and dark chocolate thumbprint cookies are “absolutely to die for” and “oh-my-gosh amazing”. I took a batch of these to work and I am honestly not kidding you when I say every single one was GONE in about 5 minutes flat. I left them in the kitchen, and I’d barely sat back down at my desk before someone came over and handed me the empty container. One coworker later stopped by and described these cookies as quite possibly the best he’s ever had. So, either this guy hasn’t eaten a lot of cookies in his life, or these are just really dang good! Believe what you will. Or, you could bake these cookies ASAP and find out for yourself! Because did I mention… dark chocolate? Homemade caramel sauce? Flaky sea salt? I don’t know about you, but this is what all my holiday baking dreams are made of!! Personally, one of my favorite things about this recipe is how wonderfully soft the dark chocolate thumbprint cookies are. I am totally a soft-and-chewy-cookie sort of girl. I was sure they would dry out overnight, but oh, was I wrong! Just make sure you don’t leave them in the oven too long, they should look slightly overdone when they come out. Mine were perfect at 11 minutes. Another trick I love is using a silicone baking mat to help bake your cookies more evenly. My sweet hubby went to a kitchen supply store a couple birthdays ago and asked them what would be a good gift for his wife who loves baking. He ended up getting me a Silpat Baking Mat , and I absolutely love it. I use it for all my cookies, but it’s a fantastic nonstick surface that makes it useful for all sorts of other recipes too. See below for a couple more of my must-have baking tools for these dark chocolate thumbprint cookies. Hoping these cookies become a last minute addition to your holiday baking list! If they do, don’t forget to post a pic and tag @flourcoveredapron on Instagram so I can get a glimpse of your your drool-worthy cookies! Preheat oven to 350 degrees and line a couple baking sheets with a silicone baking mat (or parchment paper). In a medium sized bowl, whisk together the flour, cocoa powder, salt, baking soda, and espresso powder. Set aside. Using an electric mixer, cream together the butter and sugar for a few minutes until light and fluffy. Add egg and vanilla extract, beating on low speed to combine. Gradually add in the dry ingredients, mixing on low until incorporated. Then, add heavy cream and mix again to combine. Cover and chill dough in freezer for 30 minutes. Once dough is chilled, use a medium size cookie scoop (about 1.5 tablespoons) to shape dough into balls and place on cookie sheet, a couple inches apart. This recipe makes approximately 18-20 cookies. Press down firmly in the center of each cookie with your thumb. It's okay if the dough cracks a little bit around the edges. Bake cookies for 10-11 minutes, they should look slightly underdone. Cookies will still rise a bit in the center. You can deflate the centers with the back of a spoon when they come out of the oven. Let cookies cool on pan for 5 minutes, then transfer to a wire rack to cool completely. Melt sugar in a small saucepan over medium heat, stirring frequently with a wooden spoon. Sugar will start to clump and turn amber-colored, then it will melt down. Keep stirring until the sugar has completely melted (it will liquify). Reduce heat to low and add the butter. Stir together with the melted sugar until the butter is completely melted. Warning: adding the butter will cause the mixture to bubble and splatter - this is okay! Just be careful. Carefully pour in the heavy cream while continuing to stir the mixture. Again, the mixture will bubble up at this step. Increase heat slightly to medium-low and cook the caramel sauce for another minute or so. It will look foamy and continue to bubble. Remove from heat and stir in the salt. Pour into a glass jar and let cool. Caramel will thicken up as it cools. If necessary, you can microwave it for a few seconds for a pourable consistency. Once the cookies are cool, spoon caramel sauce into the center of each cookie. Melt the chocolate chips and pour into a squeeze bottle and drizzle chocolate over the top of each cookie. Sprinkle with flaky sea salt. This recipe is adapted from A Latte Food.